A hearty carrot curry made from pureeing carrots with raisins, coconut milk, and curry powder then cooking your favorite greens until tender. Heat a dutch oven or tall-sided skillet over medium heat. Add the olive oil followed by the shallot. Saute until the shallot is fragrant and translucent, 4 to 5 minutes. Stir in the garlic and ginger, cooking for another minute or two. Measure in the curry powder followed by the carrots and golden raisins. Add the vegetable broth and coconut milk to the pot. Bring to a boil, reduce to a simmer, cover and cook until carrots are tender, 10 minutes. While the carrots are cooking, heat the 2 teaspoons of olive oil in a small pan. Cut the paneer into ½” cubes and fry over medium-low until golden, turning once during cooking. Transfer to a plate and set aside. Place the mixture carrot mixture in a blender and carefully puree until smooth. Transfer the sauce back to the pot and add the kale, in batches if necessary. Cook and wilt the kale slightly. 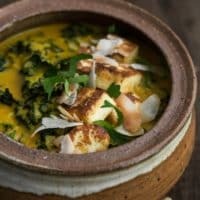 Divide the grains into two bowls and top with the kale curry, paneer, cilantro, and toasted coconut. Tips & Tricks:I am not the biggest fan of wilted vegetables and so I leave the kale slightly undercooked in this curry. It provides texture and bulk, without being too chewy. Of course, you can always cook the kale as much or as little as you like. I highly recommend testing a few different curry powders to find one you like best. Depending on the region, curry powders range is flavor and heat. It’s best to test before you dive into a recipe! Can’t find paneer? You can make it at home! 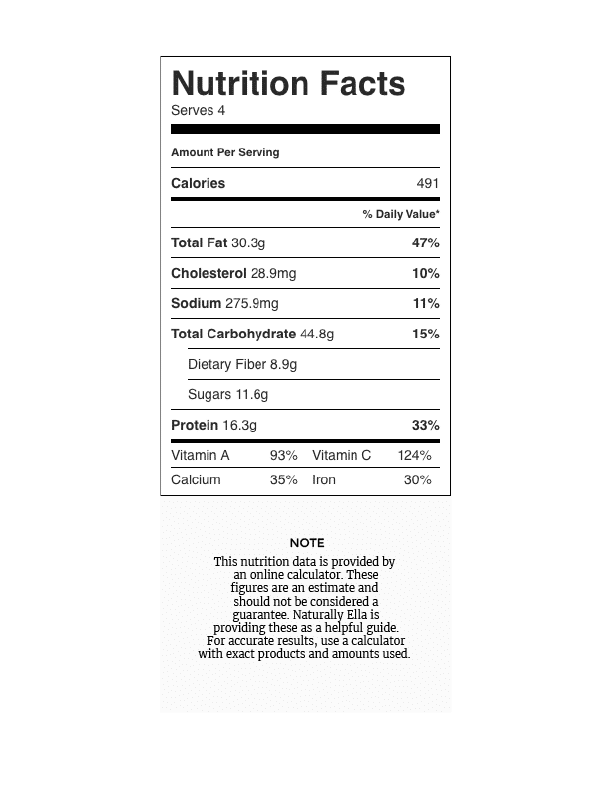 Nutrition: see the information (includes quinoa).